Voice on phone: I can help you with your cable Internet problem, sir. What operating system are you using? Man: Ubuntu Linu-- I mean, Windows 7. And oh, I already did Windows Update and a full virus scan. Voice on phone: Great! Can you browse the Internet at all? Man: Nope, Internet Explorer times out on every website. Voice on phone: And have you tried rebooting your machine? Man: Rebooted it twice before I called you. Also power-cycled my cable modem and my gateway router. Voice on phone: OK, I'm opening a trouble-ticket for you. 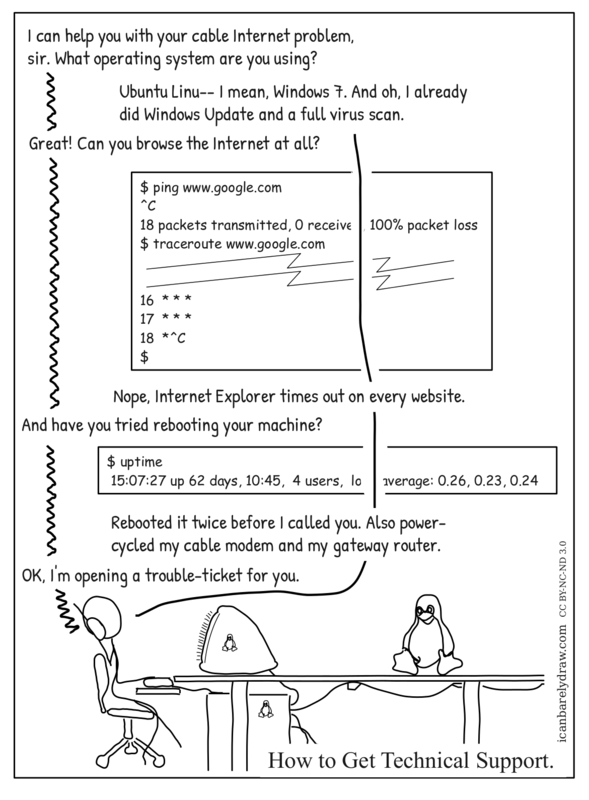 Title: How to Get Technical Support. Sounds like you have a crappy cable company. Where I work if someone calls in and says they use Linux that just means I don’t have to walk them through the control panel/cmd to check if they’re pulling valid settings from their router. I suppose it also helps that we don’t have any kinds of scripts. We’re just given a general set of guidelines and a scope of support, other than that we’re free to do what we will basically! You are lucky, Kame. The ISP I use will never touch anything that runs something other than windows xp. You sir are a champ!